The McLaren F1 is a car for responsible adults to drive so they don’t wreck them, but it’s also a car for kids who love cars. Flip up doors! Central seating position! Record-setting speed! A gold foil-lined engine bay! 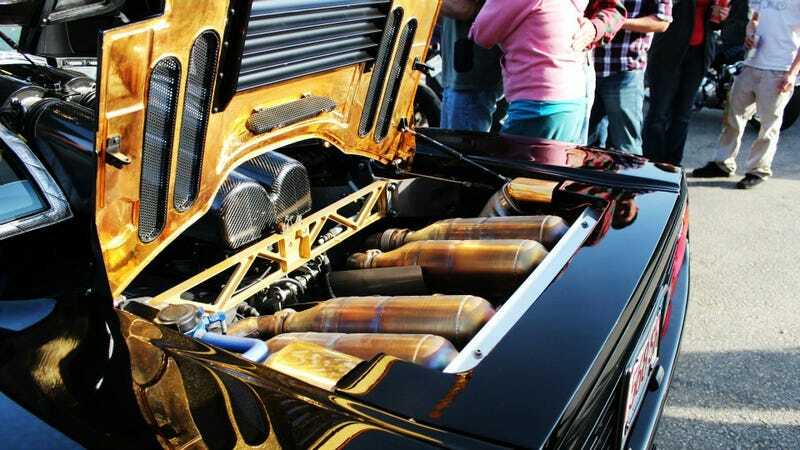 That gold is probably the most exciting part of the car because how many other cars use gold in their construction? But as it turns out, it isn’t as impressive as it sounds. The F1 famously uses gold foil in its engine bay as a heat deflector. It was, as a McLaren engineer once said, the “lightest heat-effective material” the company could use. When you open up an F1 and see the gold winking at you in the sun like a thousand promises, it’s hard to look away. You start salivating and sweating uncontrollably from being in the mere presence of something so valuable, so legendary. But how much is that gold worth, exactly? Well, consider that each F1 has 0.56 ounces (16 grams) of gold in their engine bays, according to Motor1. Gold prices at the time of this writing hover at $1,304.16 per ounce, according to GoldPrice. Which means that the gold in the F1 today is worth $730.32. Seven-hundred bucks. Only the most “special” and “best” cars on Craigslist cost 700 bucks. And they come with bees. In fact, if you somehow scraped all the gold off of an F1, melted it down into a usable shape and sold it, you wouldn’t even fetch enough to buy yourself one (1) seat for a modern Toyota Corolla. Not a whole seat, mind you, as most places don’t sell entire seats. But judging from this Toyota parts catalog, a driver’s side seat back, cushion, headrest and adjuster come out to $1,289.23.. Sorry to report that that’s a little above your budget. You would have to deface a McLaren F1 and hit up your ex for cash if you needed to replace the driver’s seat in your Corolla. In fact, that gold is probably more valuable because it’s part of an F1. I call that increased value by proximity. It’s how my friends feel all the time when they stand next to me.